NETWORK FINALS: The final 5.0 for THURSDAY NIGHT FOOTBALL was up 0.3 from last week’s rating. CABLE HIGHLIGHTS: NFL Network’s share of THURSDAY NIGHT FOOTBALL was at 0.97, down 0.07 from last week. MTV’s JERSEY SHORE dipped 0.07 to 0.70, with lead-out JERSEY SHORE FRIENDSGIVING at 0.45. TNT’s NBA doubleheader was at 0.50/0.36. MSNBC’s RACHEL MADDOW SHOW led cable news at 0.29/0.43/3M, with Fox News’s SPECIAL REPORT WITH BRET BAIER at 0.25/0.42/2.6M, and CNN’s CUOMO PRIME TIME at 0.22/0.31/1.2M. 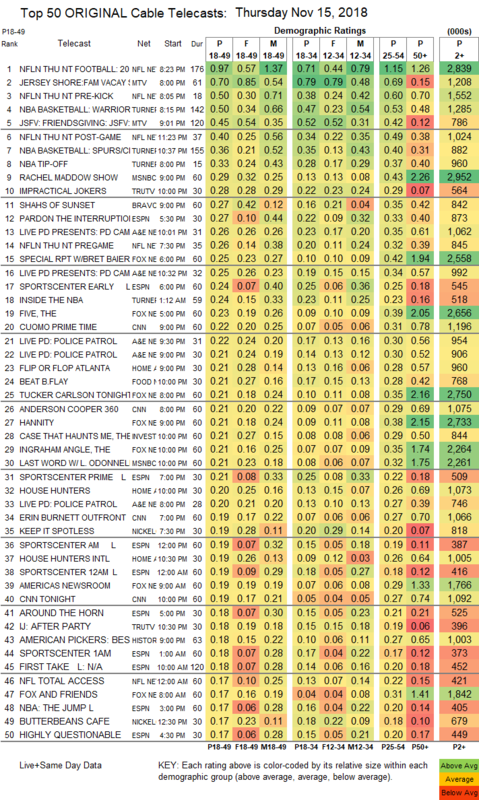 Tru’s IMPRACTICAL JOKERS was steady at 0.28, and the lead-out AFTER PARTY ticked up to 0.18. Bravo’s SHAHS OF SUNSET lost 0.04 to 0.27. A&E’s LIVE PD: PD CAM was at 0.26/0.25 compared to last week’s 0.32/0.26, and LIVE PD: POLICE PATROL was at 0.22/0.21 compared to 0.29/0.28. On HGTV, FLIP OR FLOP gained 0.02 to 0.21, HOUSE HUNTERS grew by 0.06 to 0.20, and HOUSE HUNTERS INTL was up 0.06 to 0.19. On Food Network, BEAT BOBBY FLAY was steady at 0.21. On ID, THE CASE THAT HAUNTS ME ticked down to 0.21. We’s GROWING UP HIP-HOP lost a tick to 0.17. History’s AMERICAN PICKERS held at 0.17. OWN’s BECOMING MICHELLE OBAMA special was at 0.06. 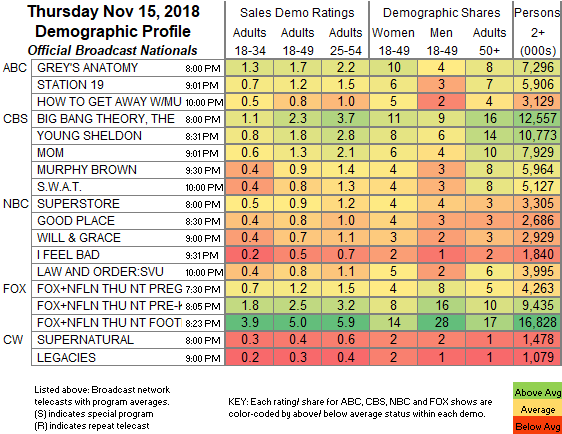 IFC’s BARONESS VON SKETCH was at 0.06/0.04, compared to last week’s 0.04/0.03. POP’s IMPACT WRESTLING dropped a steep 0.04 to 0.01/101K.